Sometimes you may find that customers often create multiple support ticket requests that are somewhat related. For example; at 9:00 am Monday morning, Sara requested help to update adobe acrobat reader on her computer. Everything went well so you've decided to mark the ticket as resolved. However, after several hours you've received a new ticket request from Sara stating that she is unable to open any PDF files on her computer. Now, you have multiple tickets in your helpdesk that are related to each other from the same customer. 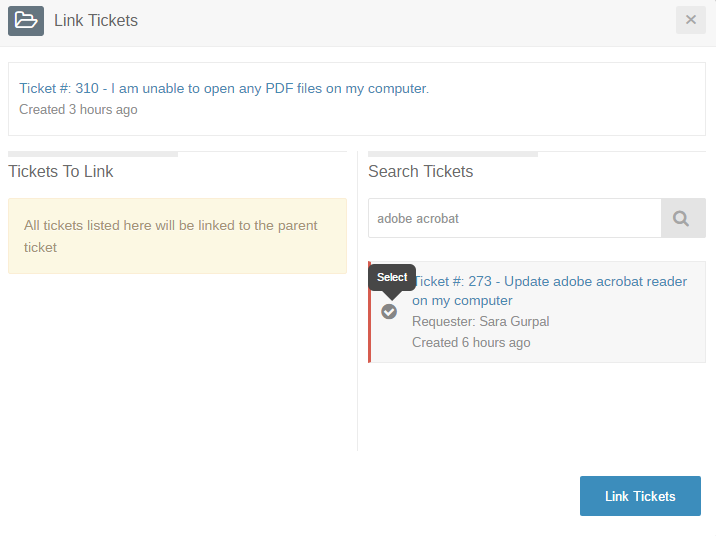 With Trakdesk Link ticket feature, you can simply link the tickets together to create a parent / child relationship. All child tickets will be listed in the parent ticket where they can be accessed at any time. Merging multiple tickets into a single ticket. Go to the Tickets Page. Select the tickets that you would like to link, then click on the More button option and select the Link Tickets option in the drop down menu. 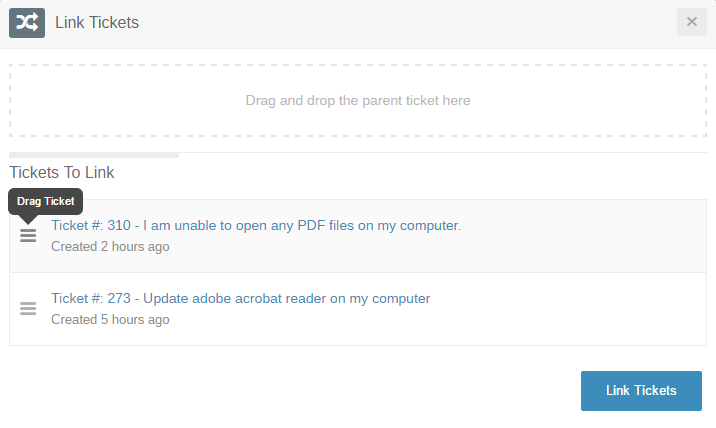 Once the popup modal has opened, drag and drop the parent ticket from the Tickets To Link list to the "Drag and drop the parent ticket here" section. Finally, click on the Link Tickets button to link the tickets together. Select any ticket. 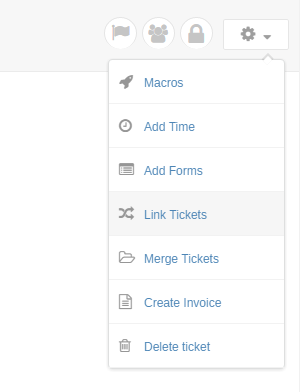 At the Top Right of the ticket view page, click on the drop down menu and select Link tickets. Once the popup modal has opened, search for the tickets that would like to link and select them by clicking on the Select ticket option. All selected tickets will be added to the Tickets To Link list. You can deselect a ticket by clicking on the Remove ticket option.